Have you decided to explore blockchain technology? Perhaps you’re interested in the unique tamper-evidencing and trustless auditability that a blockchain offers. Or maybe you want to eliminate all the “middle men” and intermediaries that slow processes with a killer app idea—one that requires your own blockchain integration and infrastructure. Regardless, knowing where to start can be challenging. 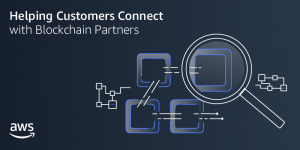 At Manifold, an AWS Partner Network (APN) Standard Technology Partner, we have built a highly scalable, cost-effective, and easy-to-integrate blockchain platform that’s architected to deploy on Amazon Web Services (AWS). With Manifold, you can simply create an Amazon Simple Storage Service (Amazon S3) bucket and deploy your own blockchain infrastructure with a single command. Manifold on AWS lets you manage blockchains for any application, from branded currencies and settlement, to asset management and intelligent automation. Our third-generation platform uses AWS Lambda to deliver a distributed ledger capability with blockchain auditability and the ability to detect possible tampering. This is provided at an extremely low operational cost while also removing integration complexity. Best of all, our Lambda-based approach means AWS handles the scaling. We believe applications built on our platform can truly achieve global scale. We chose an AWS serverless approach for a number of reasons, but three key strategic benefits stand out: ease of deployment and support, scalability, and cost. Ease of deployment and support are critical considerations for business leaders evaluating a blockchain initiative. Currently, very few commercial blockchain solutions have been deployed in production at any meaningful scale. Most commercial efforts, even those by the biggest names in the game, fizzle and fail to make it to production. In our experience, this usually happens because the prototypes are too complex for enterprise teams to integrate and support. To address this, we felt it essential that our capability could be deployed and used in a way that operations teams find helpful, not oppressive. We didn’t want to ask them to adopt entirely new workflows or monitoring tools or cause them headaches by pushing the limits of legacy data centers. In short, making our platform simple to deploy and support is critical to our enterprise strategy. The challenges of blockchain infrastructure for small-scale, prototyped applications have been addressed. It’s relatively easy to hack together a proof of concept with today’s technology. But it’s exceedingly difficult to deploy those applications at production scale. Manifold is a product company that is laser focused on solving production scale problems without sacrificing ease of prototyping. And we use the AWS serverless stack to do it. The best way to deliver scale is to let AWS handle as much of the heavy lifting as possible. 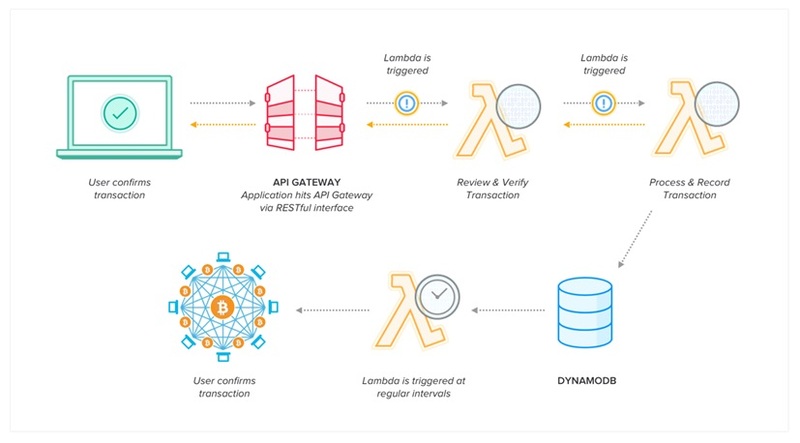 By using AWS Lambdas, we can focus on optimizing the blockchain to deliver trustless auditability with the lowest possible overhead. The strategic benefit has been a dramatically reduced integration cycle and a transaction engine that has given our own Marketplace product a competitive edge. Figure 1 – Manifold Technology’s blockchain architecture on AWS. If approached the wrong way, the benefits of a blockchain can be prohibitively expensive. But much of the back office and risk management costs in enterprises stem from costly data management and transaction auditing processes. If the expense can be mitigated, we feel blockchain technology has great potential to revolutionize these processes and many others. Blockchain can create common, secure data planes proving correctness and guaranteeing trust. It can be revolutionary, so long as the solution doesn’t cost more than the problem. AWS Lambdas are not only good for scale, they allow our platform to operate at costs that are orders of magnitude lower than traditional deployments. By leveraging Lambdas, we have created a foundation for solutions that can demonstrate value on every level. At Manifold, we’ve sought to strip away the unnecessary overhead and complexity of integrating with and using blockchains. With a simple two-step deployment process, you can launch and run your own global scale blockchain platform. Our advice? Focus on using blockchain, not integrating with it. As an AWS serverless application, Manifold scales seamlessly with AWS and delivers highly cost-efficient trust to power business transformation. We are excited to offer our technology on AWS so that you, too, can use what we believe is the most powerful and efficient blockchain infrastructure ever built as your foundation. Manifold Technology is an APN Standard Technology Partner. They have built a highly scalable, cost-effective, and easy-to-integrate blockchain platform. Manifold on AWS lets you manage blockchains for any application, from branded currencies and settlement, to asset management and intelligent automation.